Yet another variation of the mutinous clothes gag, previously seen in The Bewitched Inn (L'auberge ensorcelée) and Going to Bed Under Difficulties (Le Déshabillage impossible). Here the clothes suffer from identity issues: pants decide to become a vest, but then revert to pants, only to then become a jacket, and then back to pants, and on and on like that, until the beleaguered soul finally decides to Do The Right Thing: go back to bed. Actually, this is not too far from the less magical experience of indecisiveness about what to wear. In fact, the mutinous clothes gag chronicles the exasperation associated with any task with a shifting target. 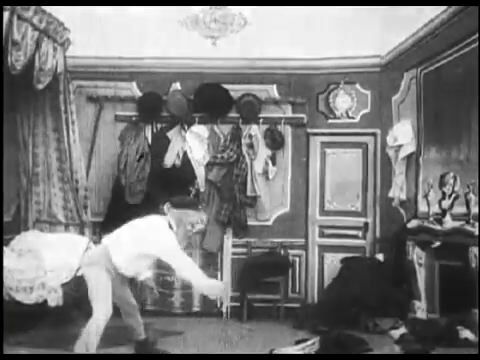 In software development, one such task is bug-fixing: fixing one bug sometimes breaks a previous fix, or introduces a new bug (Méliès certainly must have experienced such frustration in the tedious task of manually creating his special effects). More generally, the mutinous clothes gag feels like working under indecisive management, where project goals - or even the entire organization's focus - ceaselessly mutate (often under the guise of being "agile"). Méliès should be required viewing in business schools. Unlike the other films in this series, this time there finally is rest for the weary, and with the most legit excuse for sacking out: "Sorry Boss - mental health break needed! ".